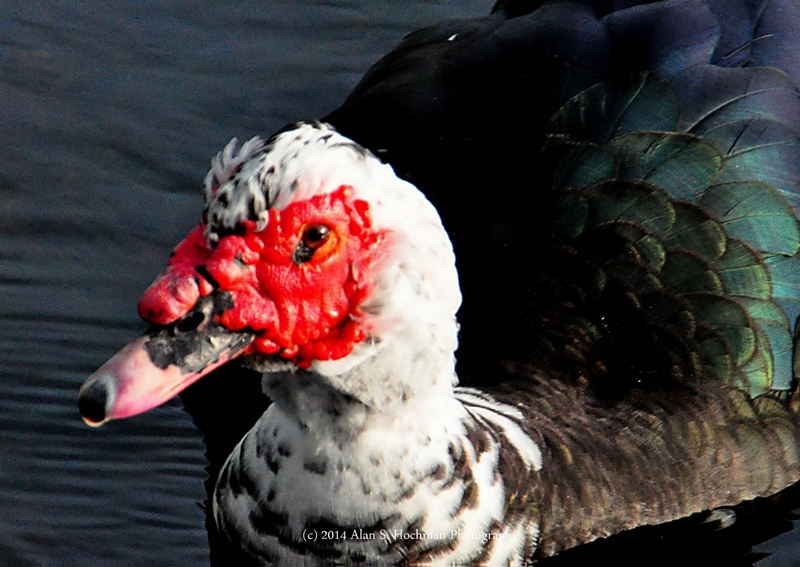 This photograph is of a Muscovy duck captured at Aqua Bowl Park, located in North Miami Beach, Florida. The camera gear used in this Muscovy duck photo is a Nikon D90 camera body attached to a Tamron 28-300mm lens plus a Tamron 2x Tele-converter. Living in South Florida, with its many rivers, lakes, and waterways, I’ve always seen these plentiful, but odd looking ducks. I just never knew what they were called. Now I know! It is the Muscovy duck. Muscovy ducks have been introduced into urban and suburban areas in Florida where they often occur in high densities. These birds were illegally released, primarily by private individuals for ornamental purposes or as pets. Muscovy ducks can be extremely prolific and local populations, if uncontrolled, can increase dramatically in a short time. As a result, controversies frequently arise between residents who enjoy the birds and residents who consider them a nuisance. The most obvious character of a muscovy is the red facial skin. If your duck has a red face, it’s probably a Muscovy Duck. This red skin can be quite bumpy, exaggerated, and frankly, gross, with a knob on top of the bill and lumps all over. If you see that, it’s a slam dunk Muscovy Duck. The wild type plumage of muscovy is all black, glossy greenish on the back, and with large white wing patches. But, because of our fondness for white, domestic muscovies can be pure white, all black, or any degree of pied black-and-white. The Muscovy Duck (Cairina moschata) is a large duck native to Mexico, Central, and South America. Small wild and feral breeding populations have established themselves in the United States, particularly in the lower Rio Grande Valley of Texas, as well as in many other parts of North America, including southern Canada. Feral Muscovy Ducks are found in New Zealand and have also been reported in parts of Europe. They are a large duck, with the males about 76 cm or 30 inches long, and weighing up to 7 kg or 15 pounds. Females are considerably smaller, and only grow to 3 kg or 7 pounds, roughly half the males’ size. The bird is predominantly black and white, with the back feathers being iridescent and glossy in males, while the females are more drab. The amount of white on the neck and head is variable, as well as the bill, which can be yellow, pink, black, or any mixture of these. They may have white patches or bars on the wings, which become more noticeable during flight. Both sexes have pink or red wattles around the bill, those of the male being larger and more brightly colored. Although the Muscovy Duck is a tropical bird, it adapts well to cooler climates, thriving in weather as cold as −12°C (10°F) and able to survive even colder conditions. I am an avid hiker, explorer and photographer living in Florida for the past 20+ years. I enjoy photographing all wildlife and that of the natural world. Currently, I work a 9-5 as a profiler and graphics coordinator for a major online website, but at every opportunity, can be found somewhere traipsing about in the Everglades or in some wooded part of Florida and beyond, following game trails, and exploring new areas where man has least traveled.